Re: Shadoweclipse13's Master Schematic Page! Super cool thread! I've been deep diving this thread for about an hour now! I was considering slightly modifying the Rhythm Circuit on may Jazzmaster so that when it was engaged, both pickups would be on in series, as apposed to the traditional single neck pickup, while keeping the lead circuit working as normal. I have been wracking my brain trying to decipher wiring diagrams and searching for hours on forums such as this for an answer but I can't seem to find anyone doing similar things unless it's specifically for a series/parallel switch. My question is, what to I need to do to accomplish this? Do I need to swap out the current switch with a 3PDT switch? This may be a simple question that has been answered elsewhere, and if so, can someone direct me to it? Thank you again for the schematics. I'll be back on this thread regularly for more mod inspiration! Super cool thread! I've been deep diving this thread for about an hour now! ... ... Thank you again for the schematics. I'll be back on this thread regularly for more mod inspiration! You're welcome man!! I'm always happy to help, and I love figuring this stuff out. It's possible to do what you say with a 3PDT switch, but my question first is: do you want the series part on whenever the rhythm circuit is engaged, or do you want the rhythm circuit to be engaged separately from a series/parallel option? 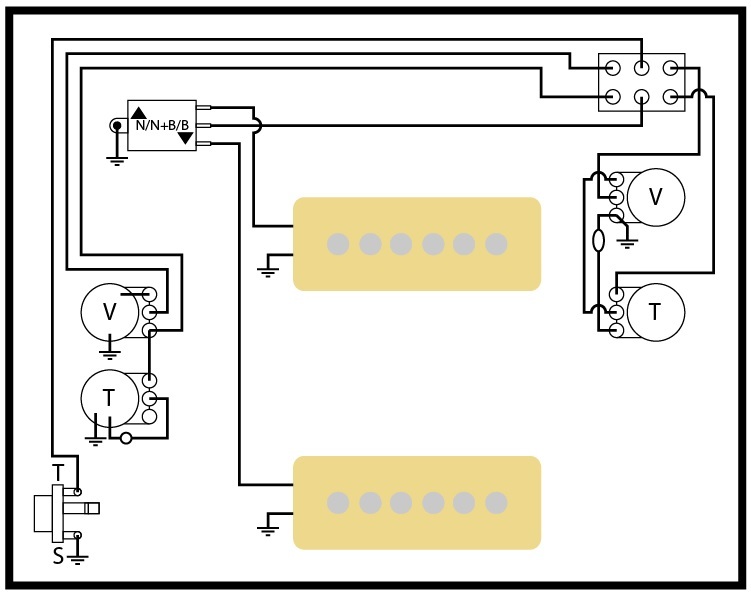 If you want separate, I'd just use my schematic that does the JM rhythm circuit for both pickups, and put the series/parallel option on a push-pull pot on either the lead circuit volume and tone. I will say that rhythm circuit series would likely be pretty dark (unusably dark, I don't know). Here's my diagram for a standard JM, except for where the rhythm circuit works for both pickups (basically, the 3-way toggle isn't taken out of the circuit for the rhythm, just the lead circuit's volume and tone pots). If you're wanting to switch from any of the 3 positions in the lead circuit directly to series-rhythm, that might be a bit trickier, if doable. I've never looked into it, but I could if that's what you're looking for. HI,I found something very interesting about one of your wiring diagram for frpax;3 humbuckers,seperate volume and tone,2P3T mustang slider...interesting because I'm working on a 12 strings prototype with very similar wiring with 3x MM5 5 strings bass pickup,each one with seperate volume,push/pull tone,2P3T rotary switch instead of mustang switch.Can you tell me how works the master on/off and I'm also thinking about adding a master volume and master tone. I'm glad to have stumbled upon this thread too. I'm getting ready to rewire my Jazzmaster with 250k pots in the lead circuit, but wanted to convert the rhythm circuit to the stock lead circuit by changing the 50k pot to 1 meg. With the 1meg pots in the lead circuit, the dual pickup setting is awesome, but the bridge pickup is thin and piercing. What I would really like is to have the rhythm circuit with the two pickups in the normal configuration (1 meg pots and parallel) and the lead circuit with the 250k pots to tame the bridge pickup. I thought it would be useful live to switch from what I would actually use for rhythm (two pickups with 1 meg circuit) and switch to the bridge pickup with the 250k pots. Is that reasonable? It would be a circuit switch and a pickup change with the rhythm/lead switch. I keep forgetting to work on that one. The one I made for frpax, I believe has an error in the pickup switch. In the case of the master on/off for that schematic, it's literally a switchable kill-switch: instead of a stutter effect, it shuts off all sound from the guitar, killing all signal. I'd imagine it was intended to be used for quiet guitar changes in a live set-up, but I'm not sure. So, you're saying that the former rhythm circuit would be 2 volume pots (one for each)? I'm not exactly sure what you're wanting to do. Can you draw up a basic switch layout? Thanks for responding. I would have the former rhythm circuit have both pickups in parallel with a volume and tone like the lead circuit (1 meg for both) instead of just the neck pickup with a 1 meg volume and a 50k tone. The lead circuit would function the same (but I would substitute 250k pots to tame the piercing bridge pickup). Another way to look at it is could you change the rhythm circuit to be bridge and neck, rather than just the neck pickup. Otherwise, I'll use the schematic you drew up where both the rhythm and lead circuit would use the toggle switch. Thanks for the advice. I'll give it a try tomorrow. I put 250k pots in the lead circuit to see how they would sound, and the volume pot only passes sound from about 7-10. The 1meg was a better fit. I sort of liked the 250k tone pot. Maybe use the 1meg for volume and 250k for tone? I figured out the sweep range problem for the volume pot. I used audio taper, not linear taper. So I guess I'm switching pots again. You should post a video/audio clip for what the 250K sounds like after you get the taper sorted. I'd be very interested to hear that.